Chris Wilson, based on the Bellerine, died at home with his loving family, courageous and strong to the end. He was a music giant, with a league of loyal fans. He joined Sole Twisters in 1984. The R&B band included Brian Horne, Barry Palmer, his brother Craig Palmer, Jeff Pickard, and Nigel Sweeney. In 1989, he played with Rod Jeffrey and the Bob Sedergreen Blues Band, Bob Sedergreen, Mal Sedergreen, Chris Wilson, Paul Wookey, Scott Dunbabin and Gordon Pendleton. There’s actually some footage of those sessions on YouTube. 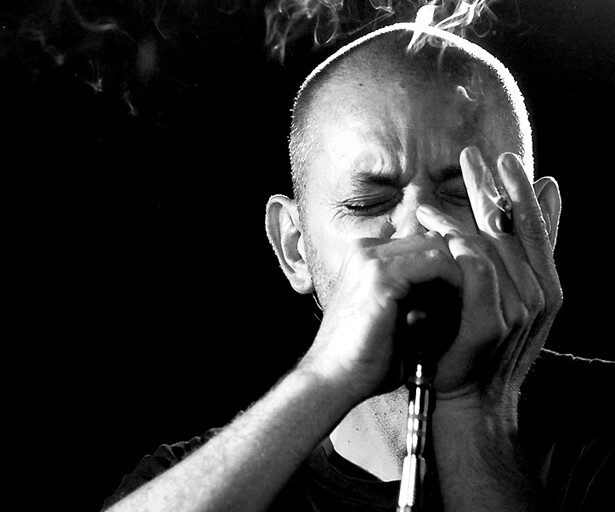 Chris is better known for the band Crown of Thorns (Barry Palmer & Chris Rodgers), and for his solo work and collaborations with Diesel, Geoff Achison, Mr Black & Blues. He also shared the bill with Bob Dylan, Elvis Costello and played with Charlie Musselwhite. In 1993 he was nominated for the best male artist and breakthrough artist ARIA awards following his Landlocked CD and the following year recorded the Live at the Continental CD at a live gig at the Continental Hotel in Prahran. The Continental CD is probably his best known work. His harmonica playing and vocals came together exquisitely, backed by Shane O’Mara and Jex Saarelaht. It is overall excellence, and it’s virtually impossible to name a standout track. Recently, it was re-released as a double CD with additional material. Chris was versatile and often played with his wife, Sarah Carroll, and they were regulars at Tamworth playing country sets. In recent years they were joined by their sons, Fenn and George. Chris might have been serious about his music, but his music wasn’t always serious. The Pirates of Beer was always good for a light-hearted session. His lyrics can stand alone as poetry as well as great music, they can be laconic, very much expressive and conveying strong emotion. His readings at the Dead Pirates Society evenings at the Piping Hot Chicken and Burger Grill (aka the Chook Shop!) in Ocean Grove were memorable. Chris was diagnosed with pancreatic cancer in July last year. The blues community organised fundraisers, through the Internet and through benefits at the Corner Hotel, Way Out West, and locally at Pistol Pete’s Food and Blues, which was also broadcast live on 94.7 the Pulse.